When asked what he meant by that, the Prime Minister shrugged and responded, “Our government will be foregoing the tedium and needling of individual, overly-specific instances of offense, and will be, instead, covering all potential offenses with a blanket law protecting everyone’s right not to be offended, not just artists.”3 His statement substantiated recent rumors that Britain was on the verge of passing yet another set of surveillance-style laws meant to protect its citizens from themselves. I'll believe it when I see it. The BBC would have to perform a complete about face to allow a non-religious viewpoint on TftD (see this post for more). After some ignominious shenanigans concerning his (surely not serious) request for a $100,000 honorarium (payable to the Richard Dawkins Foundation for Reason and Science, no less), Ray Comfort took up Thunderf00t's offer of a recorded discussion. Here is the result - 90 minutes of YouTube video well worth watching. Ray Comfort doesn't understand evolution - this is clear from his failure to engage in the basic concepts. He says he doesn't believe evolution is true (elsewhere he repeatedly describes it as "a fairy tale for grownups"), but if he doesn't understand it he's attacking a straw man - whatever he thinks evolution is, rather than what it actually is. Given what he's said (and published), this isn't surprising, but it raises an interesting parallel with his own reasons for believing in God. During his discussion with Thunderf00t he mentioned that there was much in the Bible that he didn't understand until he accepted Jesus Christ into his heart as his personal Saviour. Relative to this he's previously stated that the evidence for the existence of God is available to everyone - all they need to do is do as he did: open their hearts to the Lord. Atheists who have honestly tried this route, without the promised revelation, are told they're obviously doing it wrong. This is a self-fulfilling/defeating prophecy - just like the mediaeval dunking stool used to test witches. Any suspected witch who uses her craft to survive the test is proven guilty and shall not be suffered to live. If she drowns she was clearly innocent - no powers, no witch, and she will be set free to live her life in peace, unmolested. Unfortunately she's already dead. With most atheists the "you're doing it wrong!" excuse understandably won't wash - it's a "heads I win/tails you lose" kind of reasoning. Ray's argument in this part of the discussion also seemed equivalent (though with less sophistication) to the reasons given by theologians who object to Richard Dawkins' refutation of "simplistic" theism. A theologian will claim (with suitable snootiness) that the religion Dawkins attacks is "not my religion", and will then expound on some abstruse and intensely personal - but most importantly incomprehensible - faith (usually with profligate redefinition of terms), to the extent that the only other person who could share it is God. PZ Myers satirised this style of theology in his Courtier's Reply. One could argue, however, that atheistic objections to theology are similar to creationists' simplistic objections to evolution. We complain that the likes of Ray Comfort have no real grasp of the principles of evolution, though they decry it as fictional. Conversely, many a theologian has complained that Richard Dawkins has no real grasp of theology, while at the same time he decries the subject as vacuous. Of course, there is a crucial difference between the two disciplines. Evolution (by random genetic mutation and natural selection) is documented science that makes predictions (such as what we should expect to find in the fossil record) and so far its principles have not been disproved. In fact, each new discovery whether in genetics, paleontology or any other evolution-related field, has further confirmed evolutionary theory, to the extent that it is as near to a scientific fact as the theory of gravity. Theology, on the other hand, appears to be entirely made up. Theologians of a particular creed may agree on a core set of theological principles, but these result from consensus only, and cannot be falsified. This would be all fine and dandy for literary criticism, but for telling us anything at all about the real world, or the people in it, it's useless. I popped down to my local Maplin Electronics store today. I needed a few odds and ends in the electronics line, and found them quickly, but as I usually do I allowed time to browse around the store for anything particularly interesting. I did find a Freeview PVR that apparently records to external USB drives, which I thought was neat, though expensive at about £50 (considering it comes without storage). But that's by the by. While browsing I noticed something on display called an "eye massager". I didn't pay it much attention, though I did wonder if it physically touched your eyes in some way, or simply showed you some soothing pictures. Then I forgot about it. I don't go to the Maplin shop very often, so I picked up a copy of their Spring/Summer 2009 catalogue as it usually contains lots of useful info on all kinds of electronics-related stuff. Back home I continued my browsing, but this time in more detailed, printed form. And what did I find on page 529, in the Health section of the catalogue? Eye strain is common with people who use a computer for long periods of time, when reading, long-distance drivers and when concentrating, which can lead to headaches or even migraines. It makes you feels tired, lethargic and reduces concentration. Using this eye massager regularly can ease the problems above, making your eyes feel rejuvinated and ready for the hours ahead. Now, here’s the science behind it all. Magnetic field, in the form of physical energy, when applied on special acupuncture points, can activate the function of the cell, enlarge the blood capillary and raise the level of oxygen supply, improving the nutrition state of tissues of cells, and balance the self-disciplined nerves. Applying the above theory, and combining the curing theory of channel acupuncture in traditional Chinese medicine, this product uses both the magnetic acupuncture and mechanical acupuncture to activate the important acupuncture points around the eyes and harmonise the blood, thus improving the adjustment functions of the eye muscles and the eye nerves. The state of relaxtion is further enhanced through musical therapy as you listen to the soothing sounds of nature for a complete stimulating sensation. Notice the paragraph beginning, "Now, here's the science behind it all." This paragraph and the one after contain some of the most nonsensical woo-woo pseudoscience I've ever come across. It has been shown beyond any scientific doubt that acupuncture doesn't work - its effects are no more beneficial than the effects of placebo. I am not a doctor, but "self-disciplined nerves"? "Harmonise the blood"? Harmonise with what? Answer- This would depend upon the type of migrane you had and the severity but yes this should work. Pardon me for being sceptical, but isn't this a little irresponsible? There's no disclaimer on the page (web or print) regarding the medical qualifications of the person answering the question. Maybe the type of migraine that the eye massager will relieve is the type that is susceptible to placebo. But considering the popular interpretation of "migraine" is that of a severe, throbbing headache accompanied by nausea and disturbed vision, I doubt the device would have any effect at all. Nevertheless, I'm willing to be proved completely wrong on this. 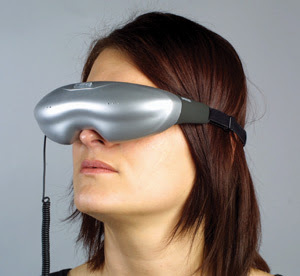 If anyone has references to decent quality clinical trials, studies or surveys that show that this eye massager is anything other than electronic snake oil, please post them in the comments. BBC Radio Four's Today Programme this morning had a five-minute segment on what has become known as the "moon hoax". There are some people who don't believe that NASA sent men to the moon; they maintain that it was all a hoax, a massive special effect set on a sound stage somewhere. "On the 40th anniversary of the moon landing, Marcus Allen, the British publisher of Nexus - a magazine which deals with the paranormal - and Professor Martin Ward, Head of physics at Durham University, discuss the conspiracy theories that have plagued this event." Interesting to hear Marcus Allen, the moon-landing denier, maintain his denial about the specific things he raised (the excellent quality of the photographs taken by the astronauts in extremes of temperature, and the fact that their film wasn't fogged by radiation). Even after Martin Ward debunked those two "anomalies" with obvious ease, Allen stated, "You can dismiss the radiation, you can dismiss the temperature - these things still exist. Photographic film is affected by radiation." At the beginning of this segment Allen said he hadn't seen the evidence for the moon-landings. Prof. Ward, in response to his specific points, presented the evidence, but the moon-landing denier refused to hear it. "Christina Rees, a member of the Church of England's General Synod, and AC Grayling, a philosopher and atheist, discuss the future of Thought." Christina Rees perpetuates the misunderstanding that godless people have nothing to offer in commentary on the ethical aspects of current affairs. She also seems to think that the call for TftD to be opened up to secular speakers is a call for theists to be excluded from the slot. What we are complaining about is that TftD is monopolised by theists, when there are equally valid non-theist viewpoints that are entirely appropriate for this brief segment of the Today Programme. It's called "Thought for the Day", not "Religious Thought for the Day", so I think our protests are valid. The argument isn't new - it comes up every six months or so, is chucked around a bit, and then forgotten until the next time. I'll be very surprised if the BBC does an about face on this. James Williams is doing essential work. Check out this recent Mail Online article, then read the comments the editors selected. There are obviously some out-and-out creationists in that group, but most of them appear to be from the United States. One of the recurring points of disagreement in intelligent atheist/theist debates is the presupposition regarding supernatural occurrences. Theists often say that the atheist is biased against supernatural occurrences because he or she does not believe they can happen, and is therefore ruling out the existence of God a priori - because God, by the most commonly accepted definition, would be a supernatural being capable of performing supernatural actions. Conversely, the theist who believes in miracles is explicitly including the possibility of supernatural occurrences, and therefore (the argument goes) is actually more open-minded - ready to accept the claims of science and the claims of supernatural action. But how does this work in practice? Is it reasonable for the atheist to rule out supernature? What if we accept that supernatural effects may, from time to time, occur - are these effects, occurrences, "miracles", bound by any laws, natural or otherwise? They are certainly not bound by the laws of science. If we accept miracles, where do we look to determine when and where they may or may not occur? It seems that miracles could only be bound by the whim of a supernatural being, who may or may not have written down (or caused to have been written down) some holy scripture in which these somewhat arbitrary whims are spelled out. Personally, I don't believe in miracles. I've not personally seen any compelling evidence for miracles, and my understanding of the world I live in suggests to me that miracles are occurrences that by definition can't happen. Any investigation into what can and can't happen in any given set of circumstances must by definition give due consideration to what is possible, and by implication, what is impossible. If an investigation doesn't rule out supernatural occurrences, then in effect nothing whatever is ruled out. On what basis, therefore, can such an investigation proceed? This is a rhetorical question - I contend that in such circumstances no meaningful investigation can be carried out. For that reason I consider it justifiable to rule out supernatural occurrences, and if as a result I'm accused of making an a priori exclusion, I can only reply "guilty as charged." In a discussion of the evidence for, say, the Resurrection of Christ, the arguments about who saw the empty tomb, or who conversed with Jesus after his death, become irrelevant, because if the Resurrection is true, all bets are off - anything is possible, and science is mocked. God could have implanted fake memories into people's brains, or performed any number of impossible actions - feats well within the capabilities of a supernatural being whose powers are essentially undefined, but which include the power to raise someone from the dead. Much as I'm reluctant to be the cause of increased "Google juice" for a creationist website (that's why I'm using the "rel=nofollow" html tag with the above link) this very long article dated 11 June 2009 at Creation Ministries International, simply entitled "Atheism", is a comprehensive run-down of arguments for and against god-belief. It's highly biased - as you'd expect - but surprisingly useful to have all the fallacies and flawed arguments in one place. A perfect illustration (in Richard Wiseman's typically non-judgmental but nonetheless quietly damning style) of why the woo artists can't be trusted when they talk about "evidence". The Daily Mail is famous for its campaigns - I'm reliably informed that this one is closely tied to the paper's abhorrence of bad verdicts from incompetent judges. The gist of this article mirrors the general thrust of the lecture James Williams gave during the BHA's recent Darwin, Humanism & Science one-day conference at Conway Hall.